Hannah and Chad Janis are a married couple currently flying to 40 countries, in business class … for free. The dynamic duo is pulling this off by maximizing travel credit card rewards. As you might’ve guessed, anyone who is traveling this much has picked up more than a few dos, don’ts and general tips. If you want to use credit card points to fund your trips with a significant other — and not break up along the way — allow Hannah and Chad to enlighten you. Without a doubt, Chad says, you must be mindful of the taxes. If you’re thinking of traveling to Europe, Hannah and Chad suggest avoiding British Airways and American Airlines. These airlines often route their flights through London’s Heathrow Airport — aka one of the most expensive airports in the world in terms of taxes and fees, Chad says. You should familiarize yourself with airline partnerships, because that’s a great way to find arbitrage. Look into the three main airline alliances — Oneworld, SkyTeam and Star Alliance — and research airlines to find out who works with whom. 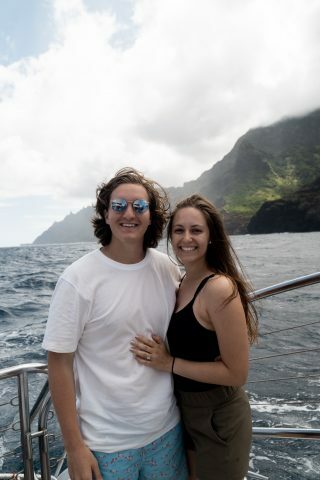 Hannah and Chad are spending a lot of time together doing what many people consider to be quite stressful — flying and working out multiple travel itineraries. How have they managed to not strangle each other? By understanding the task at hand and meeting halfway. “It’s easy to approach traveling the world like you would a vacation,” says Chad. “But when travel becomes a part of your everyday life, it’s important that you approach it as you would school or a job. Plan activities and experiences to enjoy for 8-10 hours each day, and then give yourself some time to decompress. “Also, you’ll probably have different interests that make traveling special to you. We try to have a balance between enjoying the experiences we both like, and going along with the activities that maybe only one of us would enjoy,” Chad says. Photos courtesy Hannah and Chad Janis.